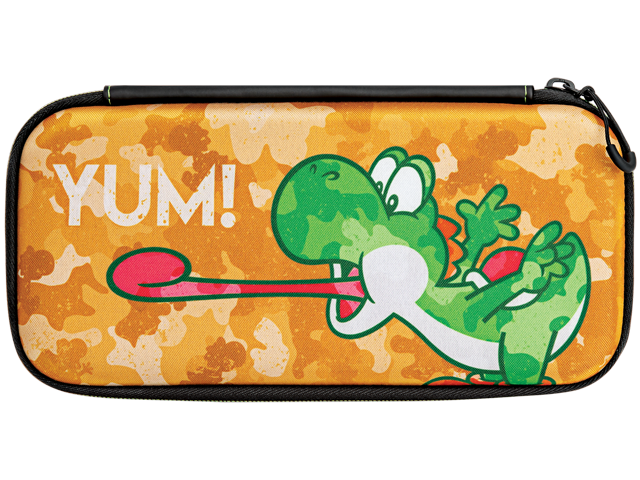 Travel with just the essentials with the Slim Travel Case - Yoshi™ Camo Edition! Featuring a sleek profile for easy carrying and a cool character camouflage design, this case will serve you well when you want to travel light. Stores Switch™ console, games and various accessories, and features a console lift strap for easy one-handed removal. Rigid EVA case with character camouflage design. Stores console, games and various accessories. Secures console inside with hook and loop strap. Nylon console lift strap for easy one-handed removal.